I’m a bit late posting a picture today because I’ve been trying to decide which one to use. I took myself off to London last week for a few days and during the day went a little bit crazy and took quite a few pictures. 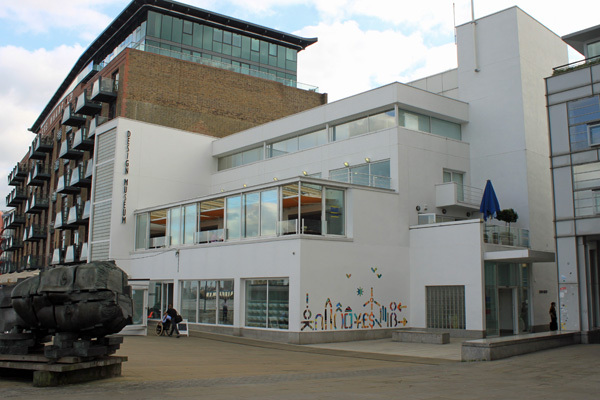 I wanted to use one of the Design Museum as it was one of the places in London I really wanted to visit. I’ve wanted to go there since it opened in 1989 and so the Designs of the Year award exhibition was a great excuse to go there. Originally it was going to be my first stop on a walk along the Thames however I reversed my walk and started at Tate Modern so I could pick up a ticket at The Globe on the way. By the time I got to Tower Bridge my feet were telling me to go no further. I almost gave in and did the Tower Bridge museum instead. I persevered and I’m glad I did because the entrance fee was worth every penny. Unfortunately afterwards I wasn’t really into the idea of taking a lot of photographs of the building so I had to go for the best of the four I took. I’ve not really done the building any favours. The exhibition included some really interesting work. The folding plug should be a massive success for Min-Kyu Choi. I had six chargers and six plugs with me for just a short break. The folding plug would have saved me so much space. The Kyoto Box, Soma and GINA Light Visionary Model all stand out in my mind a week on. The L-E-D-LED-L-ED was immense fun to interact play with. The Panda Eyes were scary but really fun. All of the work made me think and after walking about 7km (excluding distances inside buildings) in the day that was a pretty amazing achievement. One of my favourite bits of design wasn’t in the exhibition: The exhibition catalogue. It’s a compact post card sized book about a centimetre thick with an entry and its description on facing pages. The simple white cover with the categories depressed into it with the title block forming a square at the bottom left corner. Best of all it was only £5. I can flip through it when I want and get inspiration from it. As a contrast the heavyweight tomes that the Tate Modern had for the excellent Exposed exhibition: Beautiful, hard backed and £30. Travelling light by train made it a book too far. I’ve just noticed I can get it cheaper from Amazon than the Tate but still what I’d really have liked was something more like the one from the Design Museum.